In the Middle: EARTH has launched! Where does the time go? Oh yes, to my daughter's bat mitzvah, which was wonderful -- and achieved what we wanted when I blogged about it way back when. Take that, white supremacists! We danced the hora where you did your obscene salutes. And it was a great day. A bit earlier in March Lindy and I hosted twenty five celebrants at my house to swill Prosecco and devour jelly beans and cheer the publication of our book Earth in the Object Lesson series. You will have to read the work to find out why we paired that bubbly drink with that tasty candy, but I will let you know that among the flavors of jelly beans we sampled were "champagne" "beer" "popcorn" and "rotten fish." We had so much fun celebrating the publication -- and so much fun writing it together. A collaboration between a professor of English and the director of a school of earth and space exploration is not the most obvious of convergences, I think, but somehow it worked out. 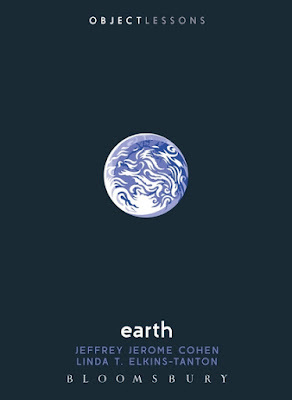 Earth is a happy volume, even as its subjects are serious, impossible, dire. Well, you will let us know if it worked. (Weirdly, the book has its first review already). Please consider picking up a copy for yourself and supporting the Object Lessons series. There is no other place we could have published this book and been so fully, so ardently supported. Thank you Chris Schaberg, Ian Bogost and Haaris Naqvi!